For other uses, see Rhinoceros (disambiguation) and Rhino (disambiguation). A rhinoceros (/raɪˈnɒsərəs/, from Greek rhinokerōs, meaning 'nose-horned', from rhis, meaning 'nose', and keras, meaning 'horn'), commonly abbreviated to rhino, is one of any five extant species of odd-toed ungulates in the family Rhinocerotidae, as well as any of the numerous extinct species. Two of the extant species are native to Africa and three to Southern Asia. The term "rhinoceros" is often more broadly applied to now extinct relatives of the superfamily Rhinocerotoidea. Members of the rhinoceros family are some of the largest remaining megafauna, with all species able to reach or exceed one tonne in weight. They have a herbivorous diet, small brains (400–600 g) for mammals of their size, one or two horns, and a thick (1.5–5 cm) protective skin formed from layers of collagen positioned in a lattice structure. They generally eat leafy material, although their ability to ferment food in their hindgut allows them to subsist on more fibrous plant matter when necessary. Unlike other perissodactyls, the two African species of rhinoceros lack teeth at the front of their mouths, relying instead on their lips to pluck food. Rhinoceros are killed by some humans for their horns, which are bought and sold on the black market, and used by some cultures for ornaments or traditional medicine. East Asia, specifically Vietnam, is the largest market for rhino horns. By weight, rhino horns cost as much as gold on the black market. People grind up the horns and consume them, believing the dust has therapeutic properties. The horns are made of keratin, the same type of protein that makes up hair and fingernails. 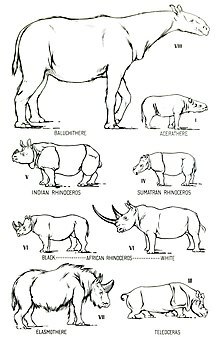 Both African species and the Sumatran rhinoceros have two horns, while the Indian and Javan rhinoceros have a single horn. The IUCN Red List identifies the Black, Javan, and Sumatran rhinoceros as critically endangered. Cladogram following a phylogenetic study. The word rhinoceros is derived through Latin from the Ancient Greek: ῥῑνόκερως, which is composed of ῥῑνο- (rhino-, "nose") and κέρας (keras, "horn") with a horn on the nose. The plural in English is rhinoceros or rhinoceroses. The collective noun for a group of rhinoceroses is crash or herd. The name has been in use since the 14th century. The family Rhinocerotidae consists of only four extant genera: Ceratotherium (White rhinoceros), Diceros (Black rhinoceros), Dicerorhinus (Sumatran rhinoceros), and Rhinoceros (Indian and Javan rhinoceros). The living species fall into three categories. The two African species, the white rhinoceros and the black rhinoceros, belong to the tribe Dicerotini, which originated in the middle Miocene, about 14.2 million years ago. The species diverged during the early Pliocene (about 5 million years ago). The main difference between black and white rhinos is the shape of their mouths – white rhinos have broad flat lips for grazing, whereas black rhinos have long pointed lips for eating foliage. There are two living Rhinocerotini species, the Indian rhinoceros and the Javan rhinoceros, which diverged from one another about 10 million years ago. The Sumatran rhinoceros is the only surviving representative of the most primitive group, the Dicerorhinini, which emerged in the Miocene (about 20 million years ago). A subspecific hybrid white rhino (Ceratotherium s. simum × C. s. cottoni) was bred at the Dvůr Králové Zoo (Zoological Garden Dvur Kralove nad Labem) in the Czech Republic in 1977. Interspecific hybridisation of black and white rhinoceros has also been confirmed. While the black rhinoceros has 84 chromosomes (diploid number, 2N, per cell), all other rhinoceros species have 82 chromosomes. However, chromosomal polymorphism might lead to varying chromosome counts. For instance, in a study there were three northern white rhinoceroses with 81 chromosomes. There are two subspecies of white rhinoceros: the southern white rhinoceros (Ceratotherium simum simum) and the northern white rhinoceros (Ceratotherium simum cottoni). As of 2013, the southern subspecies has a wild population of 20,405 – making them the most abundant rhino subspecies in the world. However, the northern subspecies is critically endangered, with all that is known to remain being two captive females. There is no conclusive explanation of the name "white rhinoceros". A popular idea that "white" is a distortion of either the Afrikaans word wyd or the Dutch word wijd (or its other possible spellings whyde, weit, etc.,), meaning "wide" and referring to the rhino's square lips, is not supported by linguistic studies. The white rhino has an immense body and large head, a short neck and broad chest. Females weigh 1,600 kg (4,000 lb) and males 2,400 kg (5,000 lb). The head-and-body length is 3.5–4.6 m (11–15 ft) and the shoulder height is 1.8–2 m (5.9–6.6 ft). On its snout it has two horns. The front horn is larger than the other horn and averages 90 cm (35 in) in length and can reach 150 cm (59 in). The white rhinoceros also has a prominent muscular hump that supports its relatively large head. The colour of this animal can range from yellowish brown to slate grey. Most of its body hair is found on the ear fringes and tail bristles, with the rest distributed rather sparsely over the rest of the body. White rhinos have the distinctive flat broad mouth that is used for grazing. The name "black rhinoceros" (Diceros bicornis) was chosen to distinguish this species from the white rhinoceros (Ceratotherium simum). This can be confusing, as the two species are not truly distinguishable by color. There are four subspecies of black rhino: South-central (Diceros bicornis minor), the most numerous, which once ranged from central Tanzania south through Zambia, Zimbabwe and Mozambique to northern and eastern South Africa; South-western (Diceros bicornis occidentalis) which are better adapted to the arid and semi-arid savannas of Namibia, southern Angola, western Botswana and western South Africa; East African (Diceros bicornis michaeli), primarily in Tanzania; and West African (Diceros bicornis longipes) which was declared extinct in November 2011. The native Tswanan name keitloa describes a South African variation of the black rhino in which the posterior horn is equal to or longer than the anterior horn. An adult black rhinoceros stands 1.50–1.75 m (59–69 in) high at the shoulder and is 3.5–3.9 m (11–13 ft) in length. An adult weighs from 850 to 1,600 kg (1,870 to 3,530 lb), exceptionally to 1,800 kg (4,000 lb), with the females being smaller than the males. Two horns on the skull are made of keratin with the larger front horn typically 50 cm long, exceptionally up to 140 cm. Sometimes, a third smaller horn may develop. The black rhino is much smaller than the white rhino, and has a pointed mouth, which it uses to grasp leaves and twigs when feeding. During the latter half of the 20th century, their numbers were severely reduced from an estimated 70,000 in the late 1960s to a record low of 2,410 in 1995. Since then, numbers have been steadily increasing at a continental level with numbers doubling to 4,880 by the end of 2010. Current numbers are however still 90% lower than three generations ago. The Indian rhinoceros, or greater one-horned rhinoceros, (Rhinoceros unicornis) has a single horn 20 to 60 cm long. It is nearly as large as the African white rhino. Its thick, silver-brown skin folds into the shoulder, back, and rump, giving it an armored appearance. Its upper legs and shoulders are covered in wart-like bumps, and it has very little body hair. Grown males are larger than females in the wild, weighing from 2,500–3,200 kg (5,500–7,100 lb). Shoulder height is 1.75–2.0 m (5.7–6.6 ft). Females weigh about 1,900 kg (4,200 lb) and are 3–4 m (9.8–13 ft) long. The record-sized specimen was approximately 4,000 kg (8,800 lb). Indian rhinos once inhabited many areas ranging from Pakistan to Myanmar and maybe even parts of China. However, because of human influence, they now exist in only several protected areas of India (in Assam, West Bengal, and a few pairs in Uttar Pradesh) and Nepal, plus a pair in Lal Suhanra National Park in Pakistan reintroduced there from Nepal. They are confined to the tall grasslands and forests in the foothills of the Himalayas. Two-thirds of the world's Indian rhinoceroses are now confined to the Kaziranga National Park situated in the Golaghat district of Assam, India. 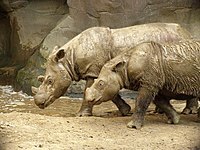 The Javan rhinoceros (Rhinoceros sondaicus) is one of the most endangered large mammals in the world. According to 2015 estimates, only about 60 remain, in Java, Indonesia, all in the wild. It is also the least known rhino species. Like the closely related, and larger, Indian rhinoceros, the Javan rhino has a single horn. Its hairless, hazy gray skin falls into folds into the shoulder, back, and rump, giving it an armored appearance. Its length reaches 3.1–3.2 m (10–10 ft) including the head, and its height 1.5–1.7 m (4 ft 11 in–5 ft 7 in). Adults are variously reported to weigh 900–1,400 kg or 1,360–2,000 kg. Male horns can reach 26 cm in length, while in females they are knobs or altogether absent. These animals prefer dense lowland rain forest, tall grass and reed beds that are plentiful with large floodplains and mud wallows. Though once widespread throughout Asia, by the 1930s they were nearly hunted to extinction in Nepal, India, Burma, Peninsular Malaysia, and Sumatra for the supposed medical powers of their horns and blood. As of 2015, only 58–61 individuals remain in Ujung Kulon National Park, Java, Indonesia. The last known Javan rhino in Vietnam was reportedly killed for its horn in 2011 by Vietnamese poachers. Now only Java contains the last Javan rhinos. The Sumatran rhinoceros (Dicerorhinus sumatrensis) is the smallest extant rhinoceros species, as well as the one with the most hair. It can be found at very high altitudes in Borneo and Sumatra. Due to habitat loss and poaching, their numbers have declined and it has become the most threatened rhinoceros. About 275 Sumatran rhinos are believed to remain. There are three subspecies of Sumatran rhinoceros: the Sumatran rhinoceros proper (Dicerorhinus sumatrensis sumatrensis), the Bornean rhinoceros (Dicerorhinus sumatrensis harrissoni) and the possibly extinct Northern Sumatran rhinoceros (Dicerorhinus sumatrensis lasiotis). A mature rhino typically stands about 1.3 m (4 ft 3 in) high at the shoulder, has a length of 2.4–3.2 m (7 ft 10 in–10 ft 6 in) and weighs around 700 kg (1,500 lb), though the largest individuals have been known to weigh as much as 1,000 kilograms (2,200 lb). Like the African species, it has two horns; the larger is the front (25–79 centimetres (9.8–31.1 in)), with the smaller usually less than 10 centimetres (3.9 in) long. Males have much larger horns than the females. Hair can range from dense (the densest hair in young calves) to sparse. The color of these rhinos is reddish brown. The body is short and has stubby legs. The lip is prehensile. Sumatran rhinoceros are on the verge of extinction due to loss of habitat and illegal hunting. Once they were spread across South-east Asia, but now they are confined to several parts of Indonesia and Malaysia due to reproductive isolation. There were 320 D. sumatrensis in 1995, which by 2011 have dwindled to 216. It has been found through DNA comparison that the Sumatran rhinoceros is the most ancient extant rhinoceros and related to the extinct Eurasian woolly rhino species, Coelodonta. In 1994 Alan Rabinowitz publicly denounced governments, NGOs, and other institutions for lacking in their attempts to conserve the Sumatran rhinoceros. To conserve it, they would have to relocate them from small forests to breeding programs that could monitor their breeding success. To boost reproduction, the Malaysian and Indonesian governments could also agree to exchange the gametes of the Sumatran and (smaller) Bornean subspecies. The Indonesian and Malaysian governments have also proposed a single management unit for these two ancient subspecies. Plantations for palm oil have taken out the living areas and led to the eradication of the rhino in Sumatra. Rhinocerotoids diverged from other perissodactyls by the early Eocene. Fossils of Hyrachyus eximus found in North America date to this period. This small hornless ancestor resembled a tapir or small horse more than a rhino. Three families, sometimes grouped together as the superfamily Rhinocerotoidea, evolved in the late Eocene, namely the Hyracodontidae, Amynodontidae and Rhinocerotidae. Hyracodontidae, also known as "running rhinos", showed adaptations for speed, and would have looked more like horses than modern rhinos. The smallest hyracodontids were dog-sized; the largest was Paraceratherium, one of the largest known land mammals that ever existed. The hornless Paraceratherium was almost seven metres high, ten metres long, and weighed as much as 15 tons. Like a giraffe, it ate leaves from trees. Hyracodontids spread across Eurasia from the mid-Eocene to early Miocene. The Amynodontidae, also known as "aquatic rhinos", dispersed across North America and Eurasia, from the late Eocene to early Oligocene. The amynodontids were hippopotamus-like in their ecology and appearance, inhabiting rivers and lakes, and sharing many of the same adaptations to aquatic life as hippos. The family of all modern rhinoceros, the Rhinocerotidae, first appeared in the Late Eocene in Eurasia. The earliest members of Rhinocerotidae were small and numerous; at least 26 genera lived in Eurasia and North America until a wave of extinctions in the middle Oligocene wiped out most of the smaller species. However, several independent lineages survived. Menoceras, a pig-sized rhinoceros, had two horns side-by-side. The North American Teleoceras had short legs, a barrel chest and lived until about 5 million years ago. The last rhinos in the Americas became extinct during the Pliocene. Modern rhinos are thought to have begun dispersal from Asia during the Miocene. Two species survived the most recent period of glaciation and inhabited Europe as recently as 10,000 years ago: the woolly rhinoceros and Elasmotherium. The woolly rhinoceros appeared in China around 1 million years ago and first arrived in Europe around 600,000 years ago. It reappeared 200,000 years ago, alongside the woolly mammoth, and became numerous. Elasmotherium was two meters tall, five meters long and weighed around five tons, with a single enormous horn, hypsodont teeth and long legs for running. Both the Coelodonta and Elasmotherium survived through the late Pleistocene when climate fluctuations, increased predation by newer predators such as hyenas and human hunting led to their extinction. There may have been a remnant population of Elasmotherium, however, in the south of Western Siberia (the area that is today Kazakhstan) as recently as 29,000 years ago. Of the extant rhinoceros species, the Sumatran rhino is the most archaic, first emerging more than 15 million years ago. The Sumatran rhino was closely related to the woolly rhinoceros, but not to the other modern species. The Indian and Javan rhinos are closely related and form a more recent lineage of Asian rhino. The ancestors of early Indian and Javan rhino diverged 2–4 million years ago. The origin of the two living African rhinos can be traced to the late Miocene (6 mya) species Ceratotherium neumayri. The lineages containing the living species diverged by the early Pliocene (1.5 mya), when Diceros praecox, the likely ancestor of the black rhinoceros, appears in the fossil record. The black and white rhinoceros remain so closely related that they can still mate and successfully produce offspring. Adult rhinoceros have no real predators in the wild, other than humans. Young rhinos can however fall prey to big cats, crocodiles, African wild dogs, and hyenas. Although rhinos are large and have a reputation for being tough, they are very easily poached; they visit water holes daily and can be easily killed while they drink. As of December 2009, poaching increased globally while efforts to protect the rhino are considered increasingly ineffective. The most serious estimate, that only 3% of poachers are successfully countered, is reported of Zimbabwe, while Nepal has largely avoided the crisis. Poachers have become more sophisticated. South African officials have called for urgent action against poaching after poachers killed the last female rhino in the Krugersdorp Game Reserve near Johannesburg. Statistics from South African National Parks show that 333 rhinoceros were killed in South Africa in 2010, increasing to 668 by 2012, over 1,004 in 2013. and over 1,338 killed in 2015. In some cases rhinos are drugged and their horns removed, while in other instances more than the horn is taken. The Namibian government has supported the practice of rhino trophy hunting as a way to raise money for conservation. Hunting licenses for five Namibian Black rhinos are auctioned annually, with the money going to the government's Game Products Trust Fund. Some conservationists and members of the public however oppose or question this practice. International trade in rhinoceros horn has been declared illegal by the Convention on International Trade in Endangered Species of Wild Fauna and Flora (CITES) since 1977. A proposal by Swaziland to lift the international ban was rejected in October 2016. Domestic sale of rhinoceros horn in South Africa, home of 80% of the remaining rhino population, was banned as of 2009. However, that ban was overturned in a court case in 2017, and South Africa plans to draft regulations for the sale of rhino horn, possibly including export for "non-commercial purposes". The South African government has suggested that a legal trade of rhino horn be established, arguing that this could reduce poaching and prevent the extinction of this species. Rhinoceros horns, unlike those of other horned mammals, (which have a bony core), only consist of keratin, similar to human hair and nails. Rhinoceros horns are used in traditional medicines in parts of Asia, and for dagger handles in Yemen and Oman. Esmond Bradley Martin has reported on the trade for dagger handles in Yemen. In Europe, it was historically believed that rhino horns could purify water and could detect poisoned liquids, and likely as an aphrodisiac and an antidote to poison. The Vietnamese are currently the biggest consumers of rhino horn, and their demand drives most of the poaching, which has risen to record levels. The "Vietnam CITES Management Authority" has claimed that Hanoi recently experienced a 77% drop in the usage of rhino horn, but National Geographic has challenged these claims, noticing that there was no rise in the numbers of criminals who were apprehended or prosecuted. South African rhino poaching's main destination market is Vietnam. An average sized horn can bring in as much as a quarter of a million dollars in Vietnam and many rhino range states have stockpiles of rhino horn. It is a common misconception that rhinoceros horn in powdered form is used as an aphrodisiac or a cure for cancer in Traditional Chinese Medicine as Cornu Rhinoceri Asiatici (犀角, xījiǎo, "rhinoceros horn"); no TCM text in history has ever mentioned such prescriptions. In Traditional Chinese Medicine (TCM), rhino horn is considered an effective medicine sometimes prescribed for fevers and convulsions, a treatment not supported by evidence-based medicine and has been compared to consuming fingernail clippings in water. In 1993, China signed the CITES treaty and removed rhinoceros horn from the Chinese medicine pharmacopeia, administered by the Ministry of Health. In 2011, the Register of Chinese Herbal Medicine in the United Kingdom issued a formal statement condemning the use of rhinoceros horn. A growing number of TCM educators are also speaking out against the practice. Discussions with TCM practitioners to reduce the use of rhino horn, has met with mixed results, because some still believe that it is a life-saving medicine. In March 2013, some researchers suggested that the only way to reduce poaching would be to establish a regulated trade based on humane and renewable harvesting from live rhinos. The WWF however opposes legalization of the horn trade, as it may increase demand, while IFAW released a report by EcoLarge, suggesting that more thorough knowledge of economic factors is required to justify the pro-trade option. To prevent poaching, in certain areas, rhinos have been tranquillized and their horns removed. Armed park rangers, particularly in South Africa, are also working on the front lines to combat poaching, sometimes killing poachers who are caught in the act. A recent spike in rhino killings has made conservationists concerned about the future of the species. In 2011, the Rhino Rescue Project, organized by Ed and Lorinda Hern of the Rhino & Lion Nature Reserve in Krugersdorp, South Africa, began a horn-trade control method consisting of infusing the horns (while on the living animal) with a mixture of a pink dye and an acaricide (to kill ticks)—which is safe for rhinos but toxic to humans. After sedating the animal, a worker drills holes into the horns, adds fittings, and connects the cavity with rubber hoses to a two-foot-by-four-inch diameter metal container of the liquid mixture, which they then pressurize. The infusion takes less than 20 minutes of the 45 minutes of anesthesia. Because of the high pressure on the animals' internal organs from their large body weight, workers turn them every seven minutes while they're sedated. The procedure also includes inserting three RFID identification chips and taking DNA samples. Because of the fibrous nature of rhino horn, the pressurized dye infuses the interior of the horn but does not color the surface or affect rhino behavior. Depending on the quantity of horn a person consumes, experts believe the acaricide would cause nausea, stomach-ache, and diarrhea, and possibly convulsions, depending on the quantity. It would not be fatal—the primary deterrent is the knowledge that the treatment has been applied, communicated by signs posted at the refuges. The original idea grew out of research into the horn as a reservoir for one-time tick treatments, and experts selected an acaricide they think is safe for the rhino, oxpeckers, vultures, and other animals in the preserve's ecosystem. Proponents claim that the dye can not be removed from the horns, and remains visible on x-ray scanners even when the horn is ground to a fine powder. The UK charity organization Save the Rhino has criticized horn poisoning on moral and practical grounds. The organization questions the assumptions that the infusion technique works as intended, and that even if the poison were effective, whether middlemen in a lucrative, illegal trade would care much about the effect it would have on buyers on another continent. They also claim that poisoned horns could heighten demand for non-poisoned horns among wealthier buyers or could fuel the belief in magical properties of the horn if people survive the poisoning. Additionally, rhino horn is increasingly purchased for decorative use, rather than for use in traditional medicine. Save the Rhino questions the feasibility of applying the technique to all African rhinos, since workers would have to reapply the acaricide every 4 years. It was also reported that one out of 150 rhinos treated did not survive the anesthesia. Albrecht Dürer created a famous woodcut of a rhinoceros in 1515, based on a written description and brief sketch by an unknown artist of an Indian rhinoceros that had arrived in Lisbon earlier that year. Dürer never saw the animal itself and, as a result, Dürer's Rhinoceros is a somewhat inaccurate depiction. Rhinoceros are depicted in the Chauvet Cave in France, pictures dated to 10,000–30,000 years ago. Greek historian and geographer Agatharchides (2nd century BC) mentions the rhinoceros in his book On the Erythraean Sea. There are legends about rhinoceroses stamping out fire in Burma, India, and Malaysia. The mythical rhinoceros has a special name in Malay, badak api, wherein badak means rhinoceros, and api means fire. The animal would come when a fire was lit in the forest and stamp it out. There are no recent confirmations of this phenomenon. This legend was depicted in the film The Gods Must Be Crazy (1980), which shows an African rhinoceros putting out two campfires. Rhinoceros depicted on a wall of the Chauvet Cave in France, ca. 10,000–30,000 years ago. ^ Owen-Smith, Norman (1984). Macdonald, D., ed. The Encyclopedia of Mammals. New York: Facts on File. pp. 490–495. ISBN 978-0-87196-871-5. ^ Gouws, Andries (8 October 2010). "Kan renosterstropers gestuit word?". Landbouweekblad: 4–6. ^ Tougard, C. et al. (2001) Phylogenetic relationships of the five extant Rhinoceros species (Rhinocerotidae, Perissodactyla) based on mitochondrial cytochrome b and 12S rRNA genes. ^ Rabinowitz, Alan (1995). "Helping a Species Go Extinct: The<33 six. Sumatran Rhino in Borneo" (PDF). Conservation Biology. 9 (3): 482–488. doi:10.1046/j.1523-1739.1995.09030482.x. ^ a b Robinson, Terry J.; V. Trifonov; I. Espie; E.H. Harley (January 2005). "Interspecific hybridization in rhinoceroses: Confirmation of a Black × White rhinoceros hybrid by karyotype, fluorescence in situ hybridization (FISH) and microsatellite analysis". Conservation Genetics. 6 (1): 141–145. doi:10.1007/s10592-004-7750-9. ^ Houck, ML; Ryder, OA; Váhala, J; Kock, RA; Oosterhuis, JE (January–February 1994). "Diploid chromosome number and chromosomal variation in the white rhinoceros (Ceratotherium simum)". The Journal of Heredity. 85 (1): 30–4. PMID 8120356. ^ a b Skinner, John D. & Chimimba, Christian T. (2005). The Mammals Of The Southern African Subregion. Cambridge University Press. p. 527. ISBN 978-0-521-84418-5. ^ Rookmaaker, Kees (2003). "Why the name of the white rhinoceros is not appropriate". Pachyderm. 34: 88–93. ^ "Western black rhino declared extinct". BBC. 9 November 2011. Retrieved 9 November 2011. ^ Keitloa | Define Keitloa at Dictionary.com. Dictionary.reference.com. Retrieved on 21 February 2012. ^ Dollinger, Peter & Silvia Geser. "Black Rhinoceros". World Association of Zoos and Aquariums. Archived from the original on 16 July 2009. Retrieved 9 October 2007. ^ "About the Black Rhino". Archived from the original on 22 February 2014. Retrieved 25 February 2014. ^ "WWF Factsheet; Black Rhinoceros Diceros Bicornis" (PDF). World Wildlife Fund. October 2004. Retrieved 9 October 2007. ^ IUCN SSC African Rhino Specialist Group (2008). "Diceros bicornis". IUCN Red List of Threatened Species. Version 2008. International Union for Conservation of Nature. Retrieved 28 November 2008. ^ Prasanta Mazumdar (30 August 2016). "One of world's biggest rhino horns found in Assam". The New Indian Express. Retrieved 31 August 2016. ^ Panda, Sasmita; Panigrahi, Gagan Kumar; Padhi, Surendra nath (2016-02-16). Wild Animals Of India. Anchor Academic Publishing. ISBN 9783960675143. ^ Bhaumik, Subir (17 April 2007). "Assam rhino poaching 'spirals'". BBC News. Retrieved 23 August 2008. ^ Derr, Mark (11 July 2006). "Racing to Know the Rarest of Rhinos, Before It's Too Late". The New York Times. Retrieved 11 October 2007. ^ "Group: Last Javan rhino in Vietnam killed for horn". usatoday.com. ^ "Last rare rhinoceros in Vietnam killed by poacher, group says". cnn.com. ^ Kinver, Mark (25 October 2011). "Javan rhino 'now extinct in Vietnam'". BBC News. Retrieved 25 October 2011. ^ "Javan Rhino". WWF. 2015. Retrieved 16 November 2015. ^ Ahmad Zafir, Abdul Wahab; Payne, Junaidi; Mohamed, Azlan; Lau, Ching Fong; Sharma, Dionysius Shankar Kumar; Alfred, Raymond; Williams, Amirtharaj Christy; Nathan, Senthival; Ramono, Widodo S.; Clements, Gopalasamy Reuben (2011). "Now or never: what will it take to save the Sumatran rhinoceros Dicerorhinus sumatrensis from extinction?". Oryx. 45 (2): 225–233. doi:10.1017/S0030605310000864. ISSN 0030-6053. ^ Benoît, Goossens; Milena Salgado-Lynn; Jeffrine J. Rovie-Ryan; Abdul H. Ahmad; Junaidi Payne; Zainal Z. Zainuddin; Senthilvel K. S. S. Nathan; Laurentius N. Ambu (2013). "Genetics and the last stand of the Sumatran rhinoceros Dicerorhinus sumatrensis". Oryx. 47 (3): 340–344. doi:10.1017/S0030605313000045. ^ Beachy, Ben (December 7, 2015). "Sharks, Tigers, and Elephants: New Analysis Reveals TPP Threats to Endangered Species". Sierra Club. ^ Hieronymus, Tobin L. (March 2009). "Osteological Correlates of Cephalic Skin Structures in Amniota: Documenting the Evolution of Display and Feeding Structures with Fossil Data" (PDF). p. 3. ^ Baraniuk, Chris (18 May 2015). "The Story of Rhinos and How they Conquered the World". BBC Earth. BBC. Retrieved 9 June 2017. ^ Hrala, Josh (27 March 2016). "A Fossilised Skull Has Revealed When The Last 'Siberian Unicorn' Lived on Earth". Science Alert. ScienceAlert Pty Ltd. Retrieved 9 June 2017. ^ Lacombat, Frédéric (2005). "The evolution of the rhinoceros". In Fulconis, R. Save the rhinos: EAZA Rhino Campaign 2005/6. London: European Association of Zoos and Aquaria. pp. 46–49. ^ Geraads, Denis (2005). "Pliocene Rhinocerotidae (Mammalia) from Hadar and Dikika (Lower Awash, Ethiopia), and a revision of the origin of modern African rhinos". Journal of Vertebrate Paleontology. 25 (2): 451–460. doi:10.1671/0272-4634(2005)025[0451:PRMFHA]2.0.CO;2. ISSN 0272-4634. Archived from the original on 23 May 2008. ^ Haraamo, Mikko (15 November 2005). "Mikko's Phylogeny Archive entry on "Rhinoceratidae"". Retrieved 7 January 2008. ^ Geraads, Denis (2010). "Chapter 34: Rhinocerotidae". In Werdelin, L.; Sanders, W.J. Cenozoic Mammals of Africa. University of California Press. pp. 675–689. ISBN 978-0-520-25721-4. ^ Becker, Damien; Pierre-Olivier, Antoine; Maridet, Olivier (22 March 2013). "A new genus of Rhinocerotidae (Mammalia, Perissodactyla) from the Oligocene of Europe". Journal of Systematic Palaeontology. 11 (8): 947–972. doi:10.1080/14772019.2012.699007. ^ Geraads, Denis; McCrossin, Monte & Benefit, Brenda (2012). "A New Rhinoceros, Victoriaceros kenyensis gen. et sp. nov., and Other Perissodactyla from the Middle Miocene of Maboko, Kenya". Journal of Mammalian Evolution. 19: 57–75. doi:10.1007/s10914-011-9183-9. ^ Deng, Tao (2008). "A new elasmothere (Perissodactyla, Rhinocerotidae) from the late Miocene of the Linxia Basin in Gansu, China" (PDF). Geobios. 41 (6): 719–728. doi:10.1016/j.geobios.2008.01.006. ^ "'Global surge' in rhino poaching". BBC. 1 December 2009. Retrieved 9 May 2016. ^ "Poachers kill last female rhino in South African park for prized horn". The Guardian. 18 July 2010. Retrieved 25 July 2010. ^ "Rhino poachers bring death toll in South Africa to record high". The Guardian. 4 November 2011. Retrieved 9 May 2016. ^ "Update on rhino poaching statistics". South African National Parks. Retrieved 18 April 2013. ^ Lucero, Louis II (17 January 2014). "South Africa: Rhino Killings Increase". The New York Times. Retrieved 20 January 2014. ^ "Rhino poaching update" (Press release). Department of Environmental Affairs. 19 December 2013. Retrieved 25 December 2013. ^ "946 rhino killed in 2013". Eyewitness News. 19 December 2013. Retrieved 25 December 2013. ^ "Record number of African rhinos killed in 2015". The Guardian. 9 March 2016. Retrieved 10 March 2015. ^ Mngoma, Nosipho (19 December 2013). "R100 000 reward for rhino poachers". IOL. Independent Newspapers. Retrieved 27 January 2014. ^ Welz, Adam (14 January 2014). "Kill a Rhino to save its species?". Deutsche Welle (DW). Retrieved 23 January 2014. ^ Baker, Aryn (January 29, 2016). "Legalizing the Sale of Rhino Horn May Only Endanger the Animals More". The New York Times. Retrieved 24 July 2017. ^ Actman, Jani (October 3, 2016). "The World Votes to Keep Rhino Horn Sales Illegal: A proposal by Swaziland to legalize trade in rhino horn was rejected at the wildlife trade conference in South Africa". National Geographic. Retrieved 24 July 2017. ^ Bale, Rachael (September 22, 2015). "A Brief History of the Long Fight to End Rhino Slaughter". National Geographic. Retrieved 24 July 2017. ^ Torchia, Christopher (July 24, 2017). "South Africa moves ahead on domestic trade in rhino horn". ABC. Retrieved 24 July 2017. ^ "Minister Edna Molewa briefs the media on Cabinet approval of the rhino trade proposal for consideration at CITES CoP17 in 2016". Department of Environmental Affairs (Government of South Africa). 3 July 2013. Retrieved 9 May 2016. ^ "GCC: Esmond Bradly Martin Reports From Yemen". Gcci.org. Retrieved 23 September 2010. ^ "Facts about Rhino Horn" (PDF). U.S. Fish and Wildlife Service. ^ Milliken, Tom; Shaw, Jo (2012). The South Africa – Viet Nam Rhino Horn Trade Nexus (PDF). TRAFFIC – Wildlife Trade News. Johannesburg, South Africa: TRAFFIC. p. 15. ISBN 978-0-9584025-8-3. ^ Wener-Fligner, Zach (13 July 2014). "Rich Vietnamese snorting rhino horns are causing a poaching explosion in South Africa". Quartz. ^ Roberts, Sue Lloyds (9 February 2014). "Vietnam's illegal trade in rhino horn". BBC. ^ "The Vietnam question". Save the Rhino. ^ Gwin, Peter (March 2012). "Rhino Wars". National Geographic. ^ Allan, Crawford (28 August 2012). "The Crisis That Is Killing Rhinos". WWF. ^ Society, Wildlife Conservation (3 November 2014). "Has Demand for Rhino Horn Truly Dropped in Vietnam?". nationalgeographic.com. ^ Northam, Jackie (January 28, 2015). "Tiger Skins And Rhino Horns: Can A Trade Deal Halt The Trafficking?". NPR. "Rhino poaching on the rise, ministers pledge to tackle illegal horn trade". International Centre for Trade and Sustainable Development. 19 February 2015. ^ Frank, Meghan & Hopper, Jessica (21 February 2012). "Spike in rhino poaching threatens survival of species". ^ Milledge, Simon (2005). "Rhino Horn Stockpile" (PDF). (1.34 MB), TRAFFIC. Retrieved 9 January 2008. ^ Guilford, Gwynn (15 May 2013). "Why Does a Rhino Horn Cost $300,000? Because Vietnam Thinks It Cures Cancer and Hangovers". The Atlantic. ^ "Rhino Horn Use: Fact vs. Fiction". PBS. 20 August 2010. ^ "Threats to Rhino – Rhino Threats – Save the Rhino". savetherhino.org. ^ Homans, Charles (31 March 2014). "The Dead Zoo Gang". Atavist. ^ The illegal trade in wild-animal products: Bitter pills, economist.com. ^ Larson, Rhishja (9 September 2011). "Chinese Medicine Organization Speaks Out Against Use of Rhino Horn". RhinoConservation.org. Archived from the original on 25 September 2011. Retrieved 26 October 2011. ^ Larson, Rhishja (15 August 2011). "TCM Educators Speak Out Against Use of Rhino Horn". RhinoConservation.org. Archived from the original on 3 October 2011. Retrieved 26 October 2011. ^ Parry-Jones, Rob & Amanda Vincent (3 January 1998). "Can we tame wild medicine? To save a rare species, Western conservationists may have to make their peace with traditional Chinese medicine". New Scientist. 157 (2115). Archived from the original on 22 June 2006. ^ Biggs, D.; Courchamp, F.; Martin, R.; Possingham, H. P. (1 March 2013). "Legal Trade of Africa's Rhino Horns" (PDF). Science. 339 (6123): 1038–9. doi:10.1126/science.1229998. PMID 23449582. Archived from the original (PDF) on 23 January 2014. Retrieved 10 December 2018. ^ Braun, Maja; et al. (15 March 2013). "Should the rhino horn trade be legalized?". Animals. Deutsche Welle (DW). Retrieved 24 January 2014. ^ Michler, Ian (16 January 2014). "Horn of contention: pro-trade thinking comes in for criticism". South Africa. Daily Maverick. Retrieved 24 January 2014. ^ "Media Release: Latest on Rhino Poaching in South Africa". South African National Parks. ^ a b c Martin Angler (9 May 2013). "Dye and Poison Stop Rhino Poachers". ^ a b c d "About the Rhino Rescue Project". Archived from the original on 6 April 2014. ^ "Injecting Poison Into Rhinos' Horns To Fight Poaching". George Stroumboulopoulos, Canadian Broadcasting Company. 5 April 2013. ^ a b c "Poisoning rhino horns". Save the Rhino International. 2013. Retrieved 29 October 2014. ^ Roberts, Jacob (2017). "Can Biotech save the rhino?". Distillations. 2 (4): 24–35. Retrieved 22 March 2018. ^ "The Refusal of Time". Harvard Magazine. 2012-05-01. Retrieved 2018-12-07. ^ "Rhinoceros Frequently Asked Questions". Sosrhino.org. Retrieved 23 September 2010. ^ The Gods Must Be Crazy, James Uys, C.A.T. Films, 1980. Cerdeño, Esperanza (1995). "Cladistic Analysis of the Family Rhinocerotidae (Perissodactyla)" (PDF). Novitates (3143). ISSN 0003-0082. Chapman, January 1999. The Art of Rhinoceros Horn Carving in China. Christies Books, London. ISBN 0-903432-57-9. Emslie, R. & Brooks, M. (1999). African Rhino. Status Survey and Conservation Action Plan. IUCN/SSC African Rhino Specialist Group. IUCN, Gland, Switzerland and Cambridge, UK. ISBN 978-2-8317-0502-6. Foose, Thomas J. & van Strien, Nico (1997). Asian Rhinos – Status Survey and Conservation Action Plan. IUCN, Gland, Switzerland, and Cambridge, UK. ISBN 978-2-8317-0336-7. Hieronymus, Tobin L.; Lawrence M. Witmer; Ryan C. Ridgely (2006). "Structure of White Rhinoceros (Ceratotherium simum) Horn Investigated by X-ray Computed Tomography and Histology With Implications for Growth and External Form" (PDF). Journal of Morphology. 267 (10): 1172–1176. doi:10.1002/jmor.10465. PMID 16823809. Laufer, Berthold. 1914. "History of the Rhinoceros". In: Chinese Clay Figures, Part I: Prolegomena on the History of Defence Armour. Field Museum of Natural History, Chicago, pp. 73–173. Unattributed. "White Rhino (Ceratotherum simum)". Rhinos. The International Rhino Foundation. Archived from the original on 20 July 2009. Retrieved 7 July 2009. Look up rhinoceros or rhino in Wiktionary, the free dictionary. Wikisource has the text of the 1911 Encyclopædia Britannica article rhinoceros.